I’ve just finished reading Heat by George Monbiot and I love this book. I loved this book before I even read it. Why? Not because I had heard it was good (which I had), nor because I knew what it was about (I didn’t). I loved this book because they way that I acquired it was the perfect way to acquire a book. This book was given to me second hand as a birthday present by a friend. What makes that such a great way to acquire a book? Let me explain: 1) My friend knew I would enjoy it, so it was a thoughtful gift. 2) It was second hand, which means reusing, which beats recycling and certainly beats buying another copy unnecessarily. 3) He didn’t have to spend money to give me a gift. Gifting is a massive contributer to over consumption which is a major contributer to the problems the world faces. Why buy people things they don’t need? You can read more about my thoughts on gifting here. Back to the topic at hand. 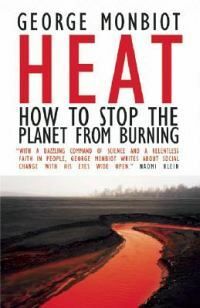 Heat is an excellent book, a book which looks at practical solutions to the problem of Climate Change, or Climate Disaster as George Monbiot prefers to call it. Climate Change sounds like it’s no big deal, when it is in fact a disaster. Climate Change, its certainty and its potential impact are not the topic of Heat, so the author discusses them only briefly before moving onto the main topic which is looking at the feasibility of meeting the required carbon emission targets to prevent more than a 2° increase in average temperature (a very dangerous tipping point). He looks at several aspects of life and industry, and evaluates the options for reducing their carbon footprint. The topics he covers are: Houses, electricity, transport, flying, shopping and cement production. He weighs up the alternatives for each topic and concludes that we can reduce the carbon footprint of each if we make some big changes. All that is, except one: Flying. The aviation industry is responsible for a large proportion of emissions and there is no way of reducing the emissions other than to fly less. This is quite disturbing because my circle of friends see flying as a necessity. For pleasure and for work, they fly around the country and around the world regularly and without compunction. Some even feel they have done their duty when they ‘offset’ their flight by paying for some tress to be planted. This is one of the main points of the book, we cannot ‘offset’ our emissions, we have to reduce them. I won’t go into the details but planting some trees to offset emissions is a complete waste of time for a number of reasons. There is no way to offset emissions, they must not be emitted and that is the only way we will save ourselves. Flying around the country or the world, must become a rarity. The last chapter of the book is particularly interesting, as George Monbiot tries to analyse why it is that we seem unable to take the measures required to prevent or reduce Climate Change. He presents several reasons which sound plausible. It think the main reason is that we are just no prepared to make the sacrifices required for something that we will only see the impact of in 20 or 30 years. If anybody takes the time to familiarise themselves with the potential magnitude of the disaster approaching us, they would realise we cannot do nothing. Each of us needs to take responsibility for our carbon footprint and we need to urge the government to put policies and measures in place to do the same thing for the country. The time for action is now for soon it will be too late. Read this book, see that it is possible and be motivated to do what is required. The Last Hours of Ancient Sunlight by Thom Hartmann. Ancient sunlight is fossil fuel and the author says we’re using it faster than it can be replaced, which is immoral. Use Less Stuff by Robert Lilienfeld & William Rathje. Quote from back cover: “Q: What do all the civilizations that practiced recycling have in common? A: They’re extinct”. One other thing. I have a DVD of George addressing the Schumacher Society at the time that “Heat” was first published. It makes for compelling viewing. Thanks Mike, I’ve added those books to my Kalahari.net wishlist. And I’d love to see that DVD!